KING’S Lynn’s Lewis Kerr won a race on his return to action in the Ben Fund Bonanza at Leicester on Sunday. 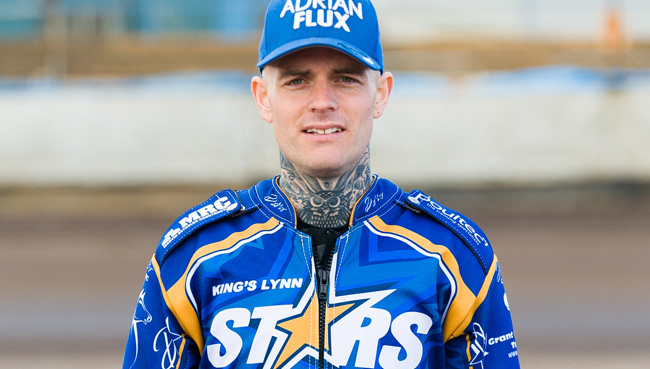 Kerr, back in the sport this season after his 2018 campaign was ended by a broken leg, took the flag in his final ride of the fund-raising event, to finish on six points. He had finished third in each of his first three rides but his chances of progressing in the meeting were ended by an exclusion for breaking the tapes in Heat 16. But he recovered from that setback to take the flag in Heat 18 from the inside gate, ahead of Ulrich Ostergaard, Paul Starke and Jedd List. And the meeting also provided useful track time for another Poultec Stars rider, with Kasper Andersen accepting a late call-up into the meeting. The Dane ran a last place in his first ride but improved as proceedings went on and also finished with six points, taking advantage of problems for Ben Barker to pass him for second place in Heat 17. Scott Nicholls, who captains Leicester in the Championship this season, emerged as meeting winner, ahead of Charles Wright and Danny King. SCORES: Scott Nicholls 13, Danny King 12, Charles Wright 12, Josh Bates 11, Sam Masters 10, Ryan Douglas 9, Richie Worrall 9, Paul Starke 8, Lewis Kerr 6, Ben Barker 6, Kasper Andersen 6, Zaine Kennedy 5, Connor Mountain (res) 4, Ellis Perks (res) 4, Ulrich Ostergaard 3, Jedd List 2, Nick Morris 0, Josh Auty 0.